So important that I make sure all my patients are educated and given suggestions of footwear after every evaluation. As bipedal (using 2 legs for walking) humans we are on our feet a lot. Our feet were also made to walk on different surfaces, such as dirt and grass, that are more form-fitting to our feet. Man made flat surfaces and because of that, we need shoes to support and stabilize our feet. The back (heel) of your shoe should not be able to fold in. 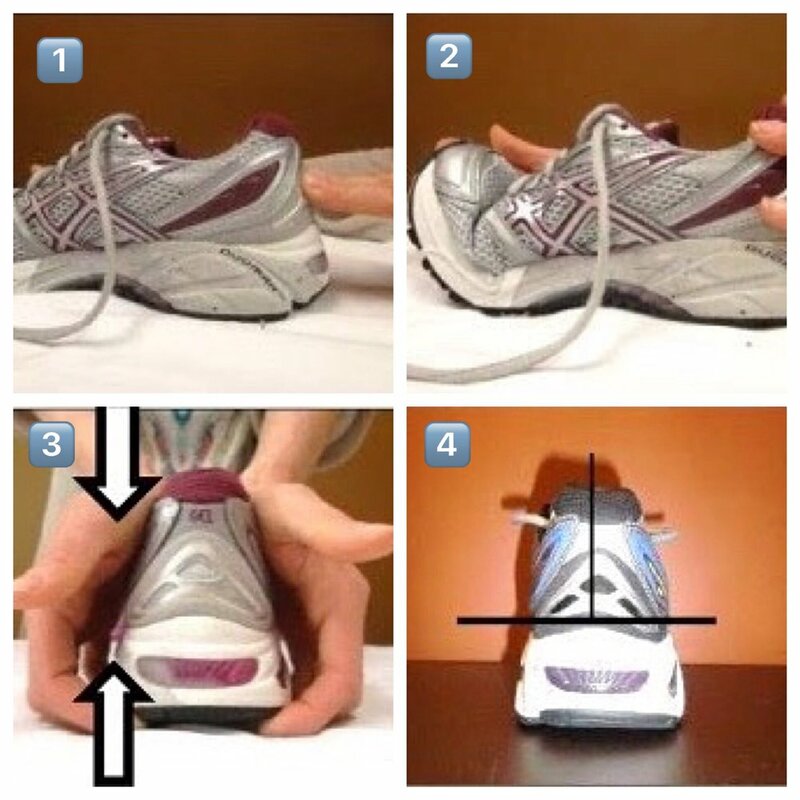 Your shoe should not bend in the middle (sorry Nike Free). Your own foot only bends at the joints near the balls of your feet and so should your shoes. If the inner or outer heel can squish together just from your hands, imagine what kind of support that provides for your body weight. Materials such as foam have too much give and can also wear down quickly over time. When placed on a flat surface, your shoe should not tilt one way or another. You'll be surprised how many shoes are built up too high on either the inner or outer heel. This can push your foot into too much supination (foot rolling in) or pronation (foot rolling out biasing a "flat foot"). Diving a little deeper into points 3 and 4, you have to think of your foot as the foundation for your entire body. If your shoe is causing you to fall into too much supination or pronation, that inevitably affects the position of your tibia (shin bone) which requires compensation from your femur (thigh bone) which requires compensation from your pelvis, lumbar spine (lower back), thoracic spine (mid back), rib cage, cervical spine (upper back), etc. as they have to compensate for instability at the foot and ankle. This is why something as simple as shoe wear can have twisting effects on joints from your ankle all the way up to your neck. If you think about those same joints twisting and compensating into the same directions every time you stand or walk, that's a lot of stress on those joints that can lead to deterioration and pain. For recommendations of good shoe wear, please check out the Hruska Shoe List for 2018. I hope this has given you some perspective on the how crucial good shoes are to your health! If you enjoyed this post, please like and share!